As the newness begins to rub off the New Year and winter’s short hours of light and long hours of darkness begin to take their toll on one’s spirits, there appear in the supermarkets of Basel, boxes, cellophane-wrapped like party packages, each containing a stack of crisp, golden, fried discs sprinkled with a snowy topping of powdered sugar. Some are about the size of a dinner plate, others about half as big. Fastnachtküchli have arrived, to be briefly (and repeatedly) enjoyed during the weeks leading up to Basel’s great celebration of Fastnacht. For anyone fortunate enough to be in Basel during carnival season, this Fastnacht treat is as close at hand as the nearest grocery store. 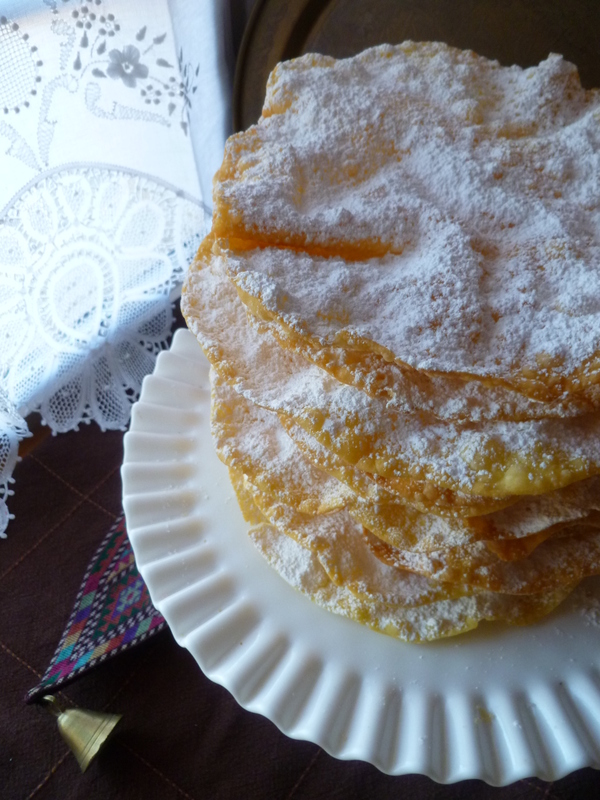 Vienna, too, for all that it has its own special carnival food traditions, makes space on the grocers’ shelves for the Fastnachtküchli of Basel. 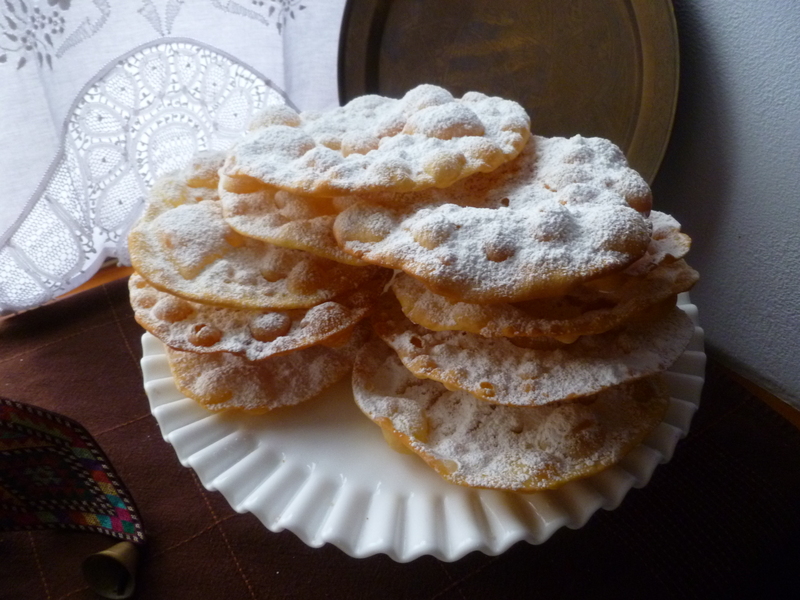 But Fastnachtküchli have been made in Swiss homes for many years and… may easily be made in yours. 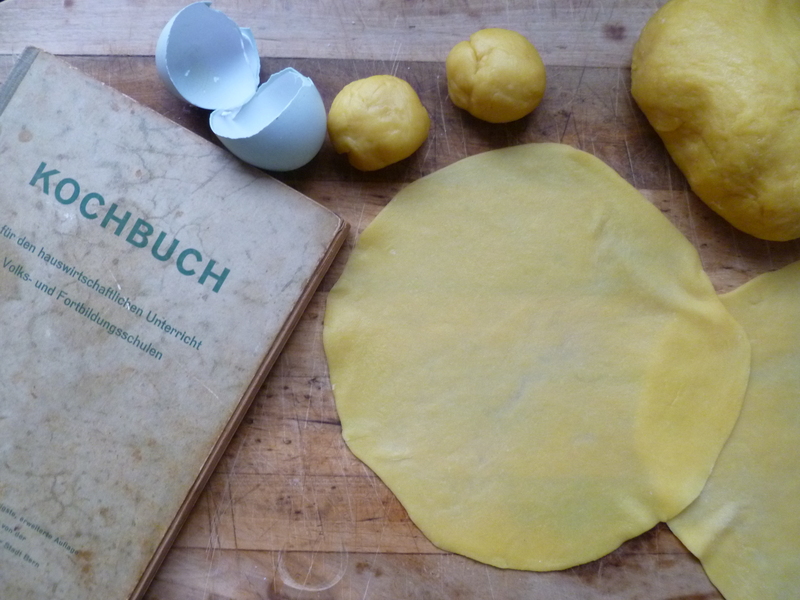 This version comes from Kochbuch, a cookbook published in 1954 by the city of Bern’s Department of Education and passed on to me by my mother-in-law Ann. They are a small taste of a celebration rich in history, tradition and very, very good times. 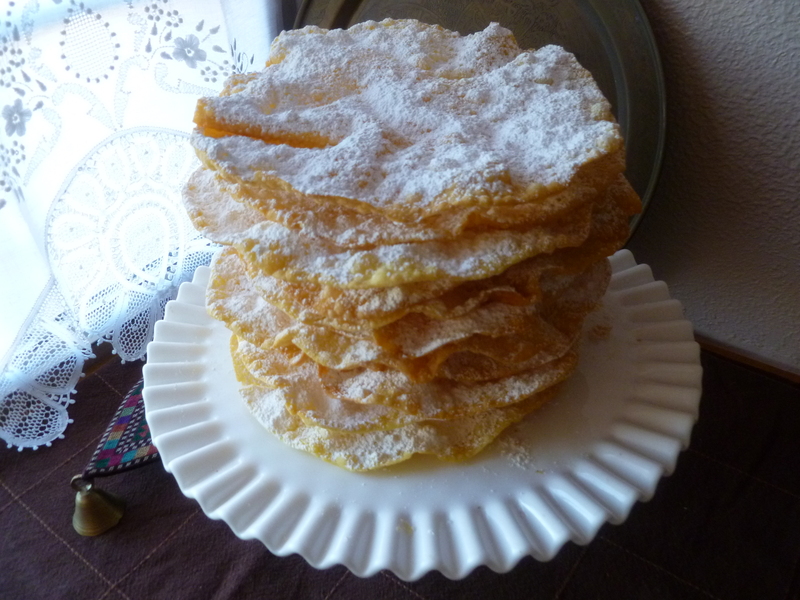 A Timing Note: Fastnachtküchli are not quick to make, which is fortunate, since the making is part of the fun. Ingredients: Amounts are given in metric units with the closest American measurement equivalents in parentheses. 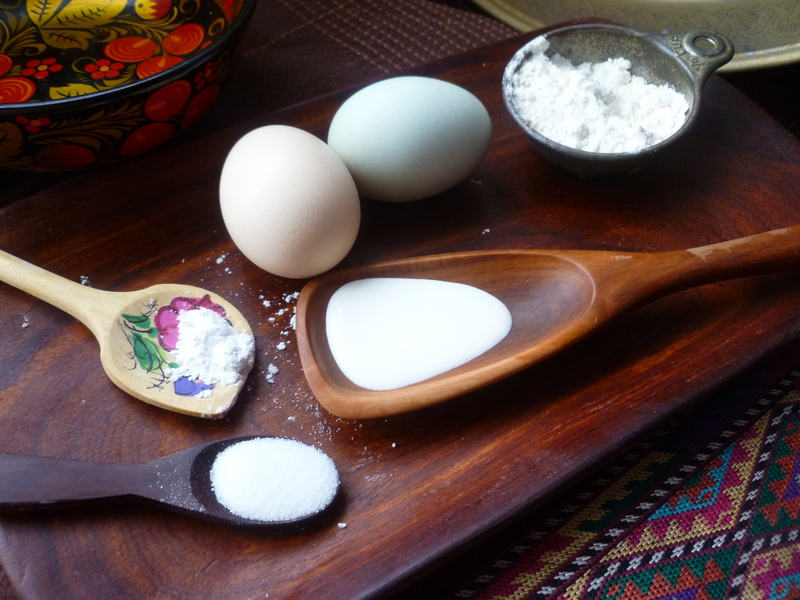 To measure the flour using American measurements, pour it into the measuring cup and level it off. Oil for deep frying: there should be enough to allow a round of dough to float freely as it fries. a Digital Scale is useful for measuring the flour and there is less variation in the amount when it is weighed. 1. Beat together the eggs and cream and salt. 2. Stir in the flour and then knead the mixture by hand (right in the bowl) until it is no longer sticky and the sides of the bowl are clean. The dough will still be very soft and pliable. When you squeeze it between your fingers, it will no longer stick to them but it will still feel moist. 3. Let the dough rest, covered with a towel, for 20 minutes. 4. Cut the dough into pieces a little larger than the size of a walnut (around 30-32 grams each, if you weigh them) and roll them into balls. Cover them with a towel. 5. Place a ball on a lightly floured pastry board and roll it into a very thin circle– about 21 cm (8-inches) in diameter. 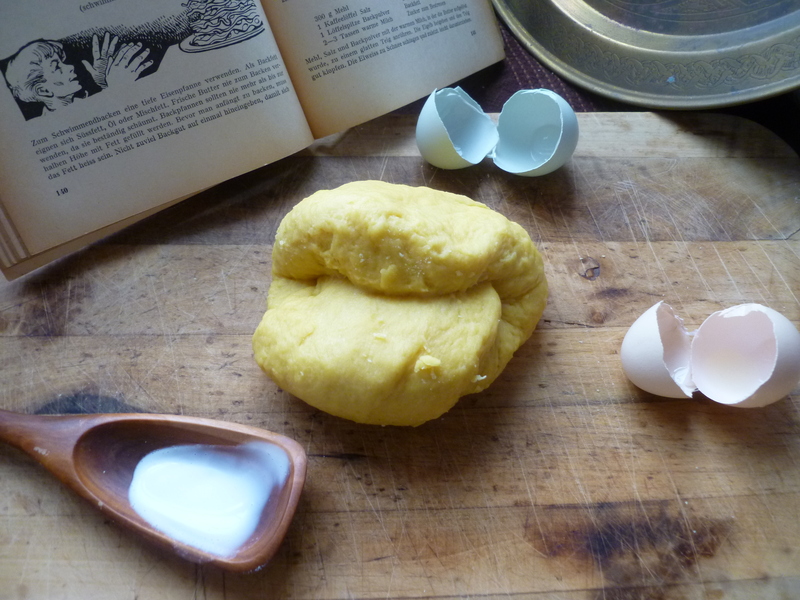 Pay particular attention to rolling out the edges, where the dough tends to be thickest. The edges will begin to crinkle as they thin out under the pressure of the rolling pin. 6. Pick up the circle and stretch it out by hand to a diameter of about 23 cm (9-inches). Place the thin dough circle on a cooling rack or a smooth cotton towel and cover it with another towel. Continue making thin rounds of dough in the same way with the rest of the dough balls, arranging them side-by-side on cooling racks or on towels as you finish stretching them by hand. 7. Put enough oil in a deep pot so that a round will float freely as it fries. Heat the oil to 176 C (350 F). 8. The rounds are fried one at a time. Pick up a round and stretch it out a little by hand one last time. Place it in the hot oil. The middle of the dough will puff up. Press it down with the back of one of the slotted spoons. Bubbles will quickly form all over the surface of the round as it fries. When the first faint traces of color appear around its edges, turn the round over with the help of two slotted spoons. Fry it a little longer until the edges of the second side just begin to colour. The second side will already be partially fried and will take an even shorter time to fry. A finished round is a very pale golden yellow, spotted here and there with deeper spots of gold. 10. 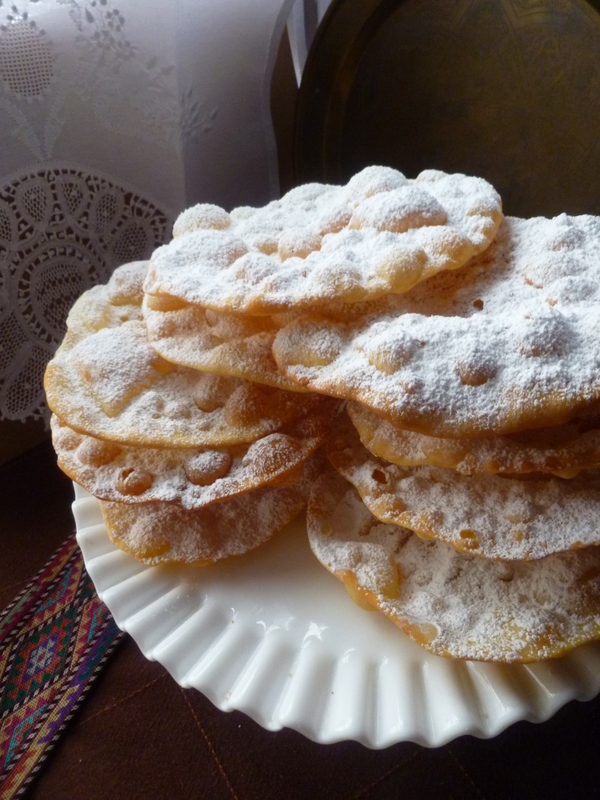 After all the rounds have been fried, place one of them on a large plate and sieve powdered sugar very liberally through a small strainer all over the cookie’s surface. Transfer it to a platter. 11. Powder the rest of the fried rounds in the same way and stack them on the serving platter. Fastnachtküchli are good warm or at room temperature. A Note: Fastnachtküchli are not part of a dk Menu. 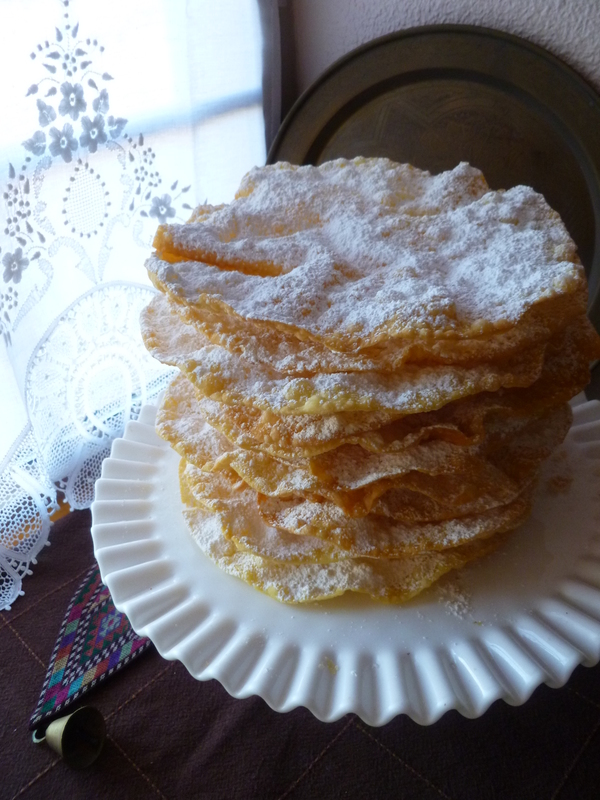 They appear here in honour of the great celebration of Fastnacht in Basel. The 2013 festivities begin on Monday, February 18 and end Thursday, February 21. You will find a brief description of Fastnacht in Basel here or may watch a film of some of the 2012 daytime festivities on YouTube. An amusing impression of an American’s first Fastnacht in Basel appeared here in the Los Angeles Times. Bless your sweet heart for providing this recipe. I have been searching and searching for good instructions to make this. I have ingredients from my Swiss family and friends, but they don’t give directions, and true measurements. I can’t wait to try this. This is the best Christmas treat ever! This has been a family tradition since the relatives came to America in the 1880’s, and most have passed away that could really make these. Thank you again very much! Yes, this is the season for them and Merry Christmas to you and your family!